There are no new changes for the 2014 Fiat 500e. 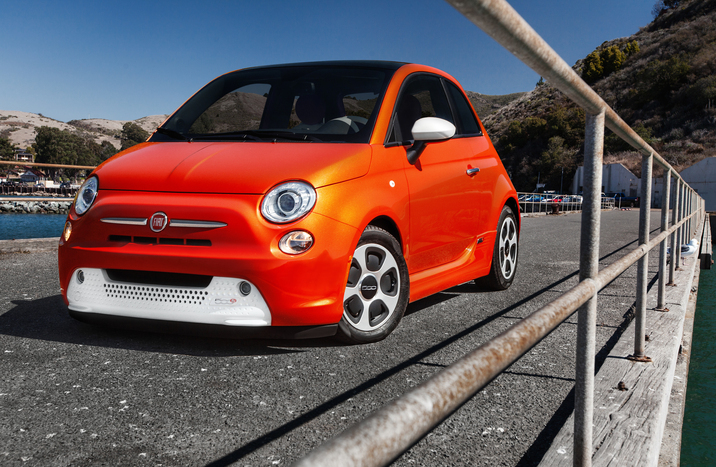 Fiat brings a touch of the European to the all-electric vehicle world with the 2014 Fiat 500e. A snub-nosed front and rounded body create a unique silhouette that has an undeniable sense of character and top aerodynamics for optimal EV performance. Add any one of the five stylish colors—especially Arancio Elettrico (electric orange)—and you’ve got yourself a car that makes a statement. To keep the 2014 Fiat 500e completely green, the EV runs on an 83-kilowatt electric motor capable of 111 horsepower and 147 lb-ft of torque and powered by a 24 kWh lithium-ion battery pack. This powertrain allows the 500e to reach 60 mpg in 8.2 seconds—an impressive time for an all-electric car. According to the EPA, the 500e has an electric range of 87 miles for a single charge, which is better than the Chevrolet Spark, Ford Focus electric, and Nissan Leaf. The 500e recharges in four hours on a 240-volt outlet. The funky feeling started on the outside makes its way into the interior with retro styling and orange accents adding a nice bit of quirk to the cabin. The unique instrument cluster displays power output, driving range, energy use, the charge of the batter pack, speed, and many, many more tidbits of information. Rather than the typical automatic transmission shifter, the 500e uses a convenient electronic push button shifter, adding a modern touch to the already modern interior. Space isn’t exactly prevalent with little rear legroom, but that’s expected in such a compact car. Antilock brakes, stability and traction control, front side airbags, side curtain airbags, a driver knee airbag, and active front head restraints are all standard safety features for the 2014 500e, along with rear parking sensors.